Take the Medellin Metro to Caribe Station (Line A towards Niquia). Fare is 2 400 COP. Get off at Caribe Station and walk cross the pedestrian bridge to the North Bus Terminal. 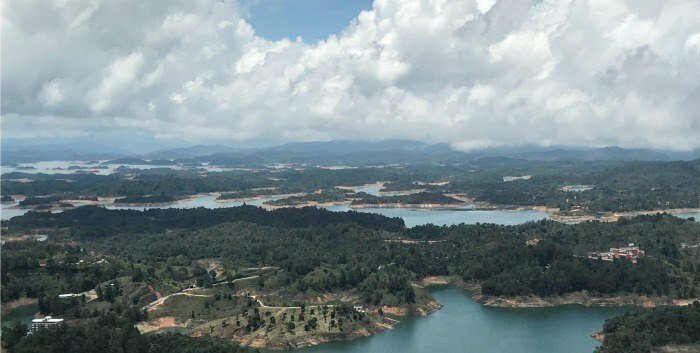 There are a few bus companies that go to La Piedra and Guatape. We used Sotrasanvicente at counter 14. The fare is 13 000 COP to La Piedra and 14 000 COP to Guatape. The departure gate will be confirmed as you go through the security check (ours was “trece” - 13). The bus ride is about 2 hours. Our first stop was for a drug dog and his handler to come aboard and do a random check. The bus will make a few random stops on the way to pick up and drop off passengers. On the way enjoy the magnificent views. Be prepared for a guy that jumps on and off the moving bus to sell potato chips and peanuts. Others jumping on and off selling "arepas de choclo" – nothing to do with chocolate but a griddled pancake made from baby corn ... buy one ...they're delicious. The road is scattered with large factories with others being built. Neat houses and haciendas. Manicured hedges and gardens. Mixed farming clinging on to the steep hillsides. El Peñol looked to be an interesting looking town. The bus stops at the base of La Piedra del Peñol or El Peñón de Guatapé ... or simply The Rock. Most of the passengers on our bus got off and there were a few people getting on after their sightseeing. From here we walked up the hill (more steps) to the base of the towering rock. You’ll also be offered other transport options to get up to the base … so take your choice. Once at the base, buy your entrance ticket for COP18,000 and start up the 740 steps! The Rock of Guatapé, also known as the Stone of El Peñol, or simply La Piedra or El Peñol, is a landmark inselberg (or monolith) in Colombia. It is also one of the largest in the world. The rock has an elevation of 2,135 meters above sea level. It is 385 meters long and 740 concrete steps have been built up the rock to reach the 360 degree viewing platform at the top. Getting from La Piedra to Guatapé town. Taxi – we paid 9 000 COP for 3 of us. Walk – downhill most of the way. The next local bus - 2 000 COP. 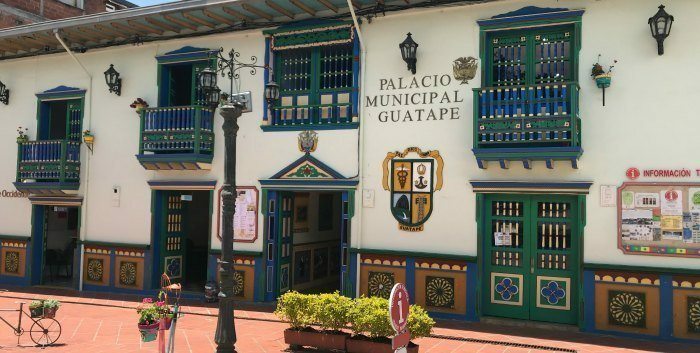 Guatapé town is absolutely unique with brightly decorated buildings and a delightful plaza. Every single building has its own character made up with vibrant wall art known as zócalos. The zócalos are a tradition unique to Guatapé and found on every building in various styles, ranging from geometric shapes to historical depictions and some that are quite hilarious. After wandering through the streets enjoying the sights and sounds we had delicious ice lollies before the trip back to Medellin. Buy your return ticket from the bus ticket office located on the lakeside road. We left at 3pm in a full bus but this didn’t prevent the driver stopping and taking on local commuters who often get off running! The cheapest tour was 97 000 COP per person (79 000 COP plus the 18 000 COP to climb the rock). Our total cost for two was 120 000 COP - nearly half the price and very easy. And we did what we wanted when we wanted. There's lots of property – both houses and land for sale.